The Flag of Mercia is a gold cross (from corner to corner) on a blue background. This flag flies from Tamworth Castle, and bares no resemblance to the proposed flag. Tamworth is the Capital of Mercia. Local historians here in Tamworth seem to think that this flag is or was the flag of the Kingdom of Mercia, and fly it as often as possible on along with other flags of the region. The saltire flag of Mercia comes from this source, along with the Sussex swallows, the Middlesex and Essex seaxes, the golden dragon of Wessex, the white horse of Kent, the golden crowns of East Anglia and the rampant lion of Northumbria. All seven of the Saxon Heptarchy kingdoms were assigned arms at a much later date. The Mercian flag is now up the Flag Registry at http://www.flaginstitute.org/wp/flags/mercia/. Mercia was the ancient kingdom equivalent to what is now known as the English Midlands. The term Mercian being associated with the Midlands long after the end of the kingdom until 1387 when a quote by John Trevisa directly links the identity of Mercia and the Midlands. The gold saltire on blue has been linked to the kingdom since at least the seventeenth century when it represents the area on John Speed’s atlas. It is likely that, like other ancient kingdoms, the arms may have been an attribution by mediaeval heralds. The saltire refers to the first British martyr, St Alban, after whom the town in Hertfordshire that also uses the saltire is also named. In Scott-Giles’ “The Romance of Heraldry” the author believes that the saltire was a Mercian symbol and adopted by the town after King Offa founded the monastery to the saint there in 793AD. It is certainly true that the first evidence for the use of the saltire by the town comes a couple of decades after its appearance on John Speed’s map representing Mercia. The historic capital of the province, Tamworth Castle continues to fly the flag every day. The flag flown from the castle uses a darker shade of blue that that flown by the town, which helps to differentiate between them. The darker shade has been acknowledged in the Mercia registration. A proposed flag for the Mercia historic region should the region be restored, according Flagmaster 103. Summarizing the article, Mercia was one of three kingdoms (Northumbria, Mercia, Wessex) that were consolidated from the Angle-Saxon heptarchy in the early 9th Century in England, and united with Wessex after the reconquest of the Danelaw in 973 under Edgar. The flag is new, designed for the Region of Mercia. Graham Walker, the designer stated, "The Mercia Movement was founded on 19 August 1993, by a group of individuals inspired by a common vision of a sustainable alternative future. It is a movement rooted in historical reality and intends to re-create Mercia as a legal autonomous entity, within the boundaries which existed prior to 1066 and within an English Confederation." The flag is intended to be adaptable for use by sub-units (i.e., counties) by adding a badge in the white field. The flag has a white field bordered above and below by wavy, light blue bands, which are each from one-quarter to one-fifth the height of the flag. A vertical green panel, one third the length of the flag, at the hoist bears a gold shield, carrying an odal rune and the word MERCIA in black. The blue bands represent the Humber and Thames, the sometime northern and southern boundaries of Mercia. The green vertical is for Offa's Dyke, a defence against the Welsh to the west. The design was approved on 12 May 2001 by the Mercia Second Constitutional Convention. According to the Acting Witan of Mercia, an organization founded in 2003 by members of the Constitutional Convention of Mercia [1, 2], the region of Mercia comprises the following traditional counties : Bedfordshire, Buckinghamshire, Cambridgeshire, Cheshire, Derbyshire, Gloucestershire, Herefordshire, Hertfordshire, Huntingdonshire, Leicestershire, Lincolnshire, Middlesex, Northamptonshire, Nottinghamshire, Oxfordshire, Rutland, Shropshire, Staffordshire, Warwickshire and Worcestershire. This organization has also proposed two flags for the region. One of the flags, clearly modelled after that of Wessex displays a silver wyrm (legless winged dragon) on dark green field [2, 4]. This is used as the regional symbol not only by its creators, but also by other regionalist movements in England, most notably the Wessex Regionalists, which seem to closely cooperate with the Acting Witan [5, 6]. The other flag [2, 4, 7] might actually be the symbol of Acting Witan, rather than that of the region, although it is difficult to tell, since it is almost always used with the Wyrm Flag. This is a vertical banner with the fly in shape of a trapezium, looking as if the bottom corners of a square were cut off diagonally. The field is in the same dark green colour as used in the first flag, and the charges are all in gold: large odal rune with the inscription MERCIA above it. There are also a gold fimbriation along the fly edge and gold fringes attached to it. The rune might actually have been borrowed from the 2001 proposal for the flag of Mercia since the founders of the Acting Witan have participated in the Mercian Constitutional Convention, which had adopted that flag. The earliest photos  showing these flags date from 2004, so they must have been adopted when the Acting Witan was founded or shortly afterwards. 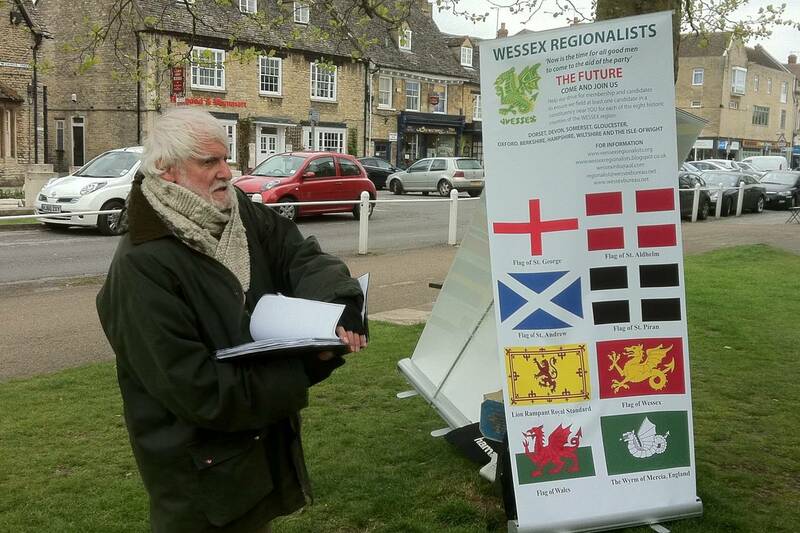 The latest photos [2, 7] date from 2013, so it is not quite clear if they were kept in use after the St Alban's flag was officially registered in 2014, although the 2016 display of the Wyrm Flag image by the Wessex Regionalists [5, 6] suggests that they might still be used.